The Three Rs: Rants, Raves and (Occasional) Reflections: Late Again...And This Time With No Excuse! Late Again...And This Time With No Excuse! Friday came and went and this morning I realized I didn't post anything on Friday. I do have something to post now, though. Jamie Randall is the envy of his peers. He has a powerful job, a beautiful wife, and two doting sons. Yet Jamie can’t stop thinking about Kate, a free-spirited photographer who saved his life fifteen years earlier. Although drawn to each other, Jamie’s ambition and desire for the finer things in life kept them apart. Now, trapped in an advantageous but loveless marriage, Jamie’s second brush with death brings him face-to-face with reality. Heading toward sure safety with his family, Jamie suddenly decides he must own up to his mistakes. But this choice comes with a hefty price: Will he chose survival with his family, or spend his final hours with his one true love? 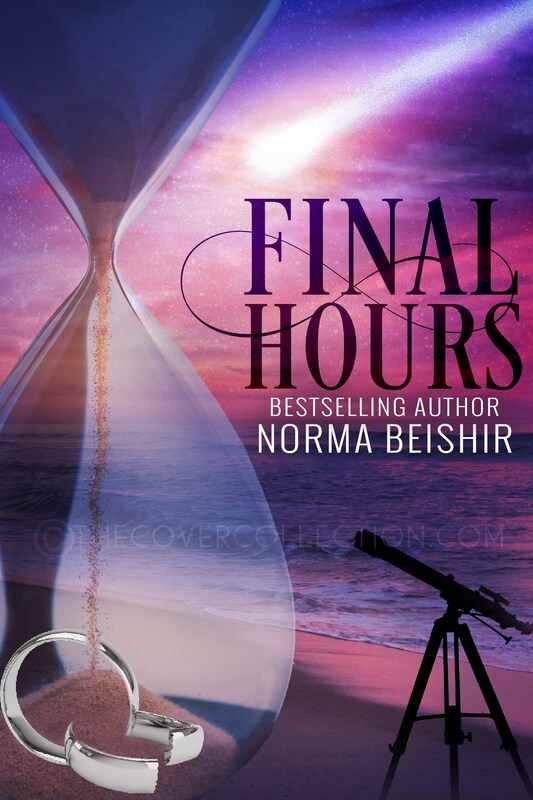 From bestselling author Norma Beishir, Final Hours is a powerful story about love, regret, and the fragility of life. When in doubt (or lacking a blog topic), promos work! Yep! Between physical therapy and CT scans, it was a crazy week. At one point, we just surrendered to the need for rest and stayed home all day, not online, TV on but not really watching. Both of us slept most of the day! I've been focusing on The Lie that blogging hasn't been a priority. Hope to post something later tonight. At work now. I'll be watching for your next post, Shelly! This book sounds fabulous, as all your books do. I am reading a "Yearling Book" 8 to 12 year olds about chickens. Trying to wake-up my brain. Very strange for someone whei used to read three books at a time. How is Collin ? Better I hope. PT has been great for Collin. I seem to come home more sore than ever. Hi Norma, I'm sorry I'm late coming by to wish you a lot of success with your promotion! Hi, Eve--no problem. I know you've had a lot to deal with yourself. I love your new cover! Your summary reminds me a little of Pride and Prejudice mixed with Wuthering Heights, so it's GOT to be good. But then, everything I've read of yours is awesome. The publisher's copywriter wrote the blurb. It's not entirely accurate, but close enough. When will we be seeing something new from you? They are also available as print books through Amazon, and Australia is among the countries in which Amazon offers them. Another great deal. Here's to selling lots and lots and lots and then more on top of that. Ask Yourself...What Do You Really Believe?